Mrs Danvers and Cathy Ames made my list too. Both a little bit unstable. I preferred Redd Heart of the Looking Glass Wars too. There was more to her. Haha! Great list. Now I know where to go to get my evil fix! Mrs Danvers made my list too. I love your description of her lol. Ah! We can't forget Bellatrix Lestrange. And even, perhaps, Lady Catherine from Pride & Prejudice. Totally agree with your list though. Number 5 especially.... can't even imagine. Lots of nasties in Fairy Tales and the wicked step-mothers. Not forgetting Cruella whatshername from 101 Dalmations. Dolores made my list too. I hate how she tried to control and have power over everything and everyone. 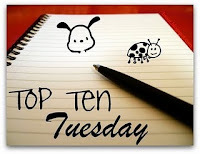 Check out my bad girls in my Top Ten post! Great list! I completely forgot about Dollanganger. She is pretty despicable! Wow, congrats on making it to 10! Umbridge is just so awful and you're right, I'm sure she was horrible as a young girl as well! Ah, that's right. Another commenter said something about all the wicked stepmothers and what not. Yes yes yes to Lady Regan...I guess I didn't think of her because I didn't read the book, but if the portrayal in the mini-series was anything like the written character she was despicable indeed! I love that you included The Lilim on your list. Georgia actually made my list (from Angus, Thongs and Full-Frontal Snogging). I don't even remember any of the other characters; Georgia was the one who stood out in my mind as the mean one.